My students constantly begged to have snowball fights in my classroom. Sometimes we did it just for fun, as a brain break, but usually I tied it to learning. This is a great way to practice comparing and contrasting skills while keeping students engaged and active. Having a snowball fight to practice comparing and contrasting skills does require a little prep work, but not much. 1. Decide what two things you would like your students to compare and contrast. Are you going to compare characters? Texts? Authors? Settings? Famous people? Animals? Cities? 3. Post the Signs in different areas around the room (possibly the 4 corners). 4. Prepare the snowballs. On a blank sheet of paper, write down a statement that corresponds to one of the signs you just created. In my example, I might write, “Can climb trees.” This statement would correspond with my “Cats” sign. Continue this process until you have at least one sheet of paper for each student. These will be your snowballs. If you would like to minimize the prep for this step, then you could give each student a blank sheet of paper and have them write the statement instead of doing it yourself. If you decide to do this, then make sure the students use their best handwriting so that other students will easily be able to read their statement. Also, encourage the students to think creatively with their statements. Otherwise, you might have a lot of repeats! 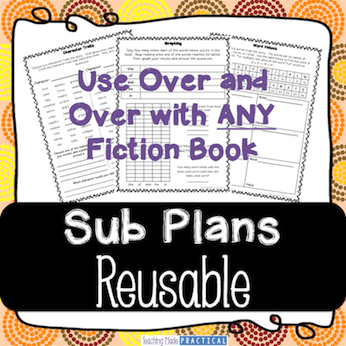 Or for a completely no prep option, check out my Comparing and Contrasting Fiction or Comparing and Contrasting Nonfiction Resources. Both of these resources include a ready to use snowball fight, as well as many other activities and reading comprehension passages. Before having the snowball fight, make sure students are very aware of your rules and expectations. Walk them through the steps below so that your snowball fight will be safe, fun, and productive instead of chaotic. 1. Make sure each student has a snowball with a statement on it. Have them crumple up their sheet of paper to make a snowball. 2. Explain the rules of the Snowball Fight to the students. When you say “Go” (or something slightly more creative), they will begin throwing the snowballs at each other. Make sure students understand that they should walk (no running) and use a calm voice (no screaming). Whenever you stay “Freeze,” students must freeze IMMEDIATELY. 3. After everybody freezes, you will ask students to find and pick up ONE snowball. Then, you will have the students open up the snowball, read the statement, and stand next to the sign that it corresponds to. 4. Explain to students that this game can be repeated if their behavior allows it. After students stand next to the correct sign, it is very easy to have students re-crumple their snowball and repeat the game. Chances are, the students will get a different statement to think about after the next snowball fight. By setting clear expectations for the snowball fight, and then “bribing” them to behave well so that the game could be repeated, I very rarely had to sit students out. And as a bonus, most of the students were absolutely EXHAUSTED after a couple of rounds, and would sit still and quiet for a little while after the snowball fights. This is a great activity to use as a quick assessment, as it allows for a quick glance around the room to make sure students are comparing and contrasting correctly. As students stand with their snowball next to a sign, quickly check to make sure they are standing in the correct spot. If the same students are repeatedly in the wrong spot, you know they are struggling with this skill. Depending on student behaviors, you could also have each group of students discuss the statements with each other and decide if they agree with everybody who is at their sign. 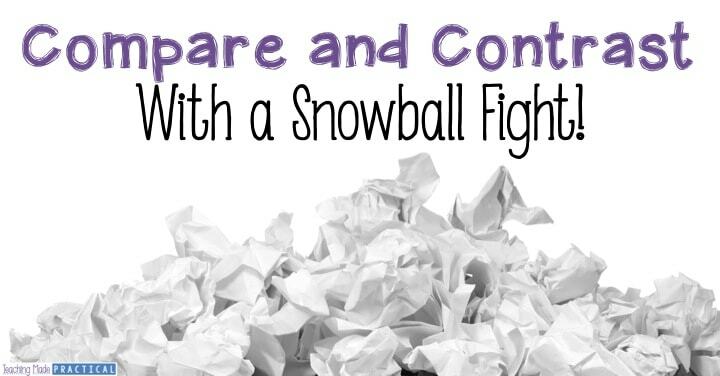 For a no prep option, check out these Nonfiction Comparing and Contrasting Snowball Fight and Reading Comprehension Activities. Each activity includes 2 reading passages with comprehension questions, a chart to compare the two topics covered in the reading passages, and a no prep snowball fight activity to give students practicing comparing and contrasting while you assess. If you like this idea, but think the snowball fight might be a little too much for your students, you could try Comparing and Contrasting Using Four Corners. This gets the students up and moving without the craziness of a Snowball Fight. Or, check out a variety of other comparing and contrasting activities. This sounds like lots of fun. I will be trying it. Obsessed! I was looking for a non-traditional way to compare/contrast 2 subjects and this is more than I could have ever dreamed! I plan to do this activity and carry it over into the next day with students picking if they would like to write about dogs or cats. They will then type and illustrate their comparison, I cannot wait! Thank you for writing this post!